The time after a new baby enters the house is a tricky one for parents who want to eat something not originally from the freezer section of the grocery store. There’s so much to do with an infant in the house and so much uncertainty about how and when to do it. It seems that things should get easier as the baby gets a bit older, but it isn’t only infants who want to be held, to be able to see and touch whichever parent is attempting to prepare a meal. My son is 2.5, and it is really only recently that cooking has gotten fairly easy again, he’s happy to sit and play with something in the next room while I prepare food, until then it could only happen easily if someone else was home to distract him. As I contemplate adding two more little ones to our household this summer, the idea of what on earth we’re going to eat is in the forefront of my mind. I’m hoping to freeze a lot of things ahead of time, but that also requires us to get moved into a new house sooner rather than later and to get a large freezer that can hold all of these things. Plus, there are times when you just don’t want one of the same old dishes you made a giant batch of and have had on rotation for weeks. Enter Debbie Koenig’s new cookbook: Parents Need to Eat Too. Parents Need to Eat Too is a cookbook specifically designed for the parents of young children. There are extremely simple recipes, recipes already divided up for you for nap time prep, slow cooker recipes, meals you can easily eat with one hand, and recipes that promote lactation for mothers who are breastfeeding. 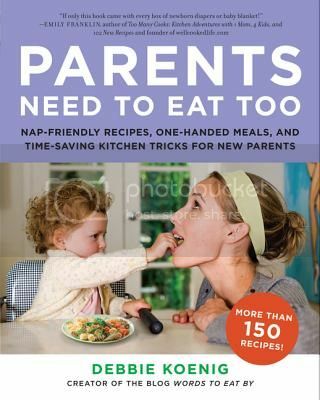 Perhaps the most helpful aspects of the book, though, are Koenig’s list of essential ingredients in the beginning (someone may get sent to the store with the book right before the twins arrive) and the tips on turning each and every recipe into baby food. Yes, you read that right, every recipe can be used as baby/toddler food. This, to me, was almost revelatory. We made most of Daniel’s babyfood, but it was usually an all-day Saturday sort of thing, cooking and pureeing vegetable after vegetable and freezing them all. You know what is easier than that? FEEDING YOUR KID WHAT YOU ARE EATING. Not only does it simply involve a little extra prep time instead of getting something completely different, if you know you won’t finish your leftovers, guess what? You can turn them into baby food and freeze them for later. Another thing I appreciated about Koenig’s book is the gustatory diversity. This is by no means a cookbook of casseroles. There are a number of Asian and Indian-inspired meals, such as the Chana Masala. Koenig freely admits that many of these recipes aren’t particularly authentic, particularly since she is aiming for things that are fast and easy to make, but they are delicious. I made her fried rice last weekend, and I must say that it simply knocked the socks off my own version (it seems the delicious secret is sesame oil, yum!). I think Parents Need to Eat Too (and maybe some of the dry ingredients from Koenig’s list) would make a wonderful gift for a new parent, or really anyone with young children. Highly recommended. I also have one copy for a lucky reader with a US mailing address. This copy will be sent out by HarperCollins. Please enter on the form below by noon Eastern on Tuesday, February 28. This sounds like it would be just perfect for my brother and sister-in-law. Their little one is just over a year old. Great giveaway. And a book I will be needing soon here, huh? You really will. I could have seriously used it with Daniel. My kids are 6, 3.5, and almost 2. You’d think I’d have figured out how to get meals on the table by now, but I could still use the tips and inspiration a book like this can offer! I hope to win, but I can see myself buying this book as well. Good luck to you with your move and with getting that big freezer. We had one in our old house and left it behind. I have sorely missed it! Wow, this looks like a great cookbook. This might just become my go-to shower gift along with a book for baby. Sounds like a great book for new parents. Those books are always helpful when you get into a situation you know nothing about beforehand. Don’t know how parents with little ones manage to cook at all — what a good resource this is. Thanks for featuring it. Great idea! Did you say you are expecting twins-wow! I just had mine one at a time. Twins would be cool but a lot of work… I had 3 step sons and 4 sons and 1 daughter. Only 2 kids left at home (so I have empty nest syndrome). To feed them (the ones I actually gave birth to) I would nurse them for years lol and then whoever was the baby at the time would hang out on my lap at meal time and I would give them little morsels. I’m kinda primitive. Haha! Wow — almost makes me wish I were expecting so I could enter the giveaway. And — sesame oil. Yeah! awesome. Store it in the refrigerator; it goes rancid quickly otherwise. Well, the nap recipes would be great to prepare during short breaks for those who work from home! Sounds like a very useful book for families with young kids… with this had been around ten years ago! What a clever concept! I certainly could have used this when my sons were babies. Too late for me, mine are older! I’d give it as a gift, what a great idea for a cookbook! Excellent idea for a book. I already know three young families who could use this book. I love this as a gift idea. I remember those days.. I could barely get dinner on the table. It was crazy. I could have used a book like this back then. I love Channa Masala! Haven’t made it in a while..
What a great concept! It sounds like it was implemented well, too.